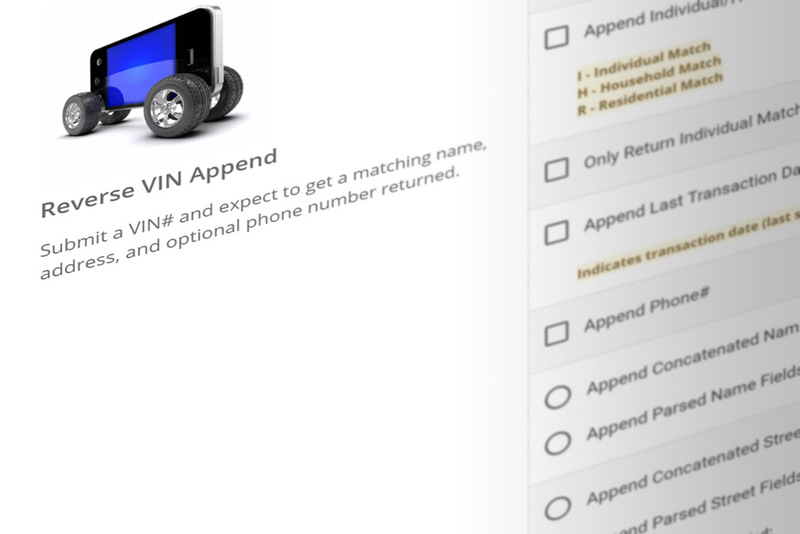 Append name, address, and phone number to a vehicle VIN for your customer records. Real-time access to over 190 million vehicles fully populated with vehicle owner name and address information. Our automotive data is built compiling over 15 sources, and enhancements include consumer demographics like age, household income, and presence of children for a majority of the records. Speed-to-market and information accuracy are critical to your marketing campaign’s success. The UpdateYourList.com DIY Portal allows marketers who need automotive ownership information to instantly append name, address, and telephone number information to their customer and prospect files in real-time to get the most out of their contact records. The automobile database is fully compliant with privacy laws, making it a very attractive data set for acquisition and retention campaigns for all marketers who rely on automobile owner data.